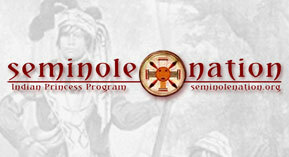 Due to the nature of our program some events The Seminole Nation ("Nation") and its members participate in have some degree of safety hazards (i.e. camp fires, swimming lakes etc.). The safety of our members is important to the Nation and its voluteer program officers. The following rules must be followed by all participants during any Nation event. Each Tribe should conduct a safety meeting to share and discuss the following rules with all its members, fathers and children at the beginning of every campout, or event. First and foremost this is a father - daughter program, and as such we expect the Dads to police themselves and children accordingly. Basic First Aid Kits are mandatory for each tribe to bring to any Nation and/or tribe sponsored event. Children should never be left unattended by either a tribe campfire or Nation bonfire. Tribe campfires should also not be left unattended by the tribe's adult(s) while it is lit. A means of extinguishing a campfire should be available within eye distance from a campfire. This can either be a running water source, an up to date fire extinguisher, or as a last resort at least two full five gallon buckets of water. Adults should teach their members not to throw any objects in a camp fire, includes, but not limited to, sticks, paper, leaves, Spanish moss, camping chairs, bottles, cans, glow sticks, etc. Of course this excludes the need to use wood or paper to start the fire or keep fire from self-extinguishing. Adults should teach children that “the fire must stay in the fire” do not let them light sticks or other items and remove from fire. Adults should remember to explain to your children that even if there are no visible flames, a campfire pit may still have hot ambers that are not always visible, especially during the day. All propane tanks must be kept upright during use, this can be done by utilizing a stand designed for the use or some type of container that will not tip easily and hold the tank upright. Grocery store milk crates are a good example. Many fires are caused by tipping propane tanks according to fire officials. All children should be kept away from cooking areas. Many tribes use caution tape to roap off their kitchens. An up to date fire extinguisher should be readily available within ten feet of cooking area. A water hose in not acceptable for this purpose, grease fires cannot be extinguished by water. Cooking area should never be unattended during use of any portable cooking appliances. Many venues we as a Nation or Tribe visit have some sort of body of water. Some have actual swimming lakes and swimming is encouraged. The Nation supplies quaulified lifeguards for Nation sponsored events only, however we still ask our fathers to watch their child while swimming. Tribe adults must also be diligent at tribe sponsored events. Many venues are not designated as a “swimming venue”, therefore no lifeguards are arranged by either the Nation or the venue. In these cases, adults and children are therefore swimming at their own risk. Again we ask our fathers to supervise their child while swimming while attending these events. If you are unsure if an event is a “swimming event” please check the event flyer or contact one of your Nation Officers. Canoes & Kayaks are available to use or rent at some events (both swimming and non-swimming). All members must wear a life jacket at all times while in a canoe or kayak. Parental supervision is required during the use of a canoe or kayak. In addition each venue will have their own posted rules regarding the use of their equipment that must additionally be followed. Florida has dangerous wildlife. Tribe members should be diligent to keep a watchful eye for dangerous wildlife that may be encountered at Nation and/or tribe hosted event and communicated sightings to tribe and Nation leaders. Water Rides are also available at some venues (i.e. water trampolines, water slides, etc.) Qualified lifeguards will be hired for these types of activities. Parental supervision is also required. These type of activities do have some degree of hazard and are therefore used at the swimmer's and parent's own risk. Swimming pools are available at some venues, but no lifeguards are supplied. All children must be accompanied by their fathers while swimming in these “At Your Own Risk” facilities. Some venues may have more mud than usual after storms. Fathers must discuss with their chidren the hazards of getting stuck in mud pits, especially at the Peace River Campground where the detph of the pit is not always known. Playing in mud pits can be risky and if done is done at your ond your child's own risk. Some venues offer Arial Rides, (i.e. zip lines, rock walls, rope courses, Towers, etc.). These Arial Rides are maintained and inspected by the proper authorities and are run by trained staff members of the venue, not the Nation. Parental guidance is required while your child is partaking in these activities. Horseback riding, is another activity sometimes offered during our events. Children must be accompanied by their father to ride on a horse guided tour, there are no exceptions! Helmets must be worn and all other safety rules established by the venue must be obeyed. Most venues have minimum age requirements that fathers must adhere to before allowing their child to ride. At Nation hosted events golf carts or the like, whether rented or privately owned, can only be driven by a valid driver’s license holder who is 18 years or older. Most venues will mercilously confiscate rented golf carts if driven by a minor. The golf cart owner or renter is ultimately responsible for any accidents of injury involving the golf cart, not the Nation. Fireworks are forbidden, with the exception of the Nation’s North, South, East, and West mortars as part of the Fire Circle Ceremony. These “N, S, E, and W” fireworks are lit over 200 feet from the group exceeding the National Fire Protection Association’s requirements. The Nation reserves the right to terminated a member's participation in the program if they are found to be operating fireworks at Nation events. “Chinese Flying Paper Lanterns” are not permitted. Most venues are too wooded, and this creates a fire risk. Firearms are not permitted onsite, unless 1) are concealed, stored and locked in accordance with Florida State law, and 2) owner must possess the proper State issued concealment permits. Firearms should never be taken out of concealment for any reason unless the venue offers a sanctioned firearm range. Pellet guns, slingshots, airsoft guns, bow and arrows, etc. shall not be permitted and Nation events, unless used in an authorized location designed for that use by the venue. Cars parked in our campsite pose a danger and an eyesore for all of us camping together. When a venue has a designated parking area please be courteous and use it. No capturing of wildlife at Nation events.